We plan to be at "31-ET" in Colchester, Essex, UK. Well :) That was a thing! 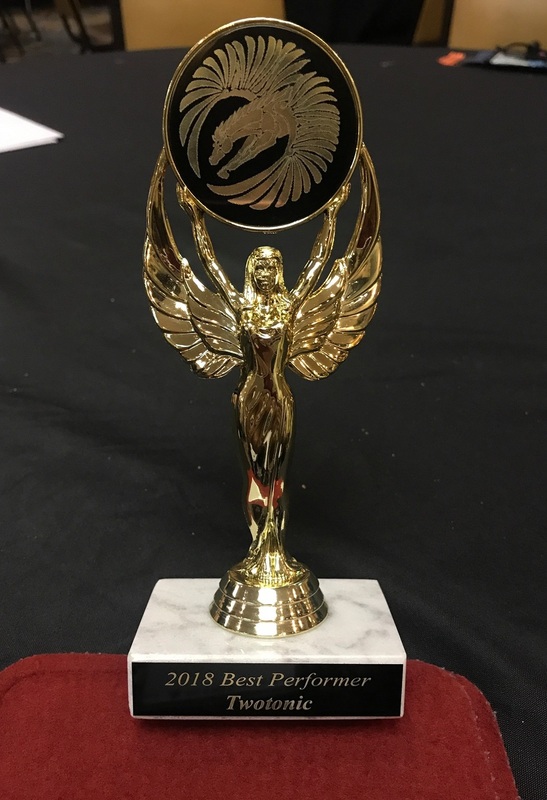 Twotonic was honoured with the Pegasus Award for "Best Performer" at OVFF in 2018! We tied with our friends from "Random Fractions" :) We are happy and grateful! We are attending "OVFF 34" in Worthington, OH, USA. Twotonic intend to be at "FilKONtario 28" in Toronto, ON, Canada. We are looking forward to seeing many of our friends! We will be at "Enhar30nicon" in Colchester, Essex, UK. Tom & Sue Jeffers generously shared their videos of our CD release concert with us! So, now we have our own Youtube channel, with currently four vids up there ... more to come, hopefully :) Check it out!